Through his service, Dr. Shay has led the grant review process for the Foundation’s efforts to fund research for women’s cancers including breast, cervical, ovarian and uterine cancer, resulting in a collective investment of $23.5 million since 1996. Grant applications from medical schools and schools of public health are evaluated through a blind, peer-review effort coordinated by Dr. Shay utilizing past grantees. Selected organizations receive a $100,000 grant from The Mary Kay FoundationSM to further their research and practice. Cancer is the second leading cause of death in women, with more than 800,000 new cases of cancer among women in the United States expected in 2016, according to the American Cancer Society. The Mary Kay FoundationSM is dedicated to decreasing women’s cancer death rates and to funding research for women’s cancers that will help find a cure for the disease. Dr. Shay holds numerous United States patents and is the recipient of multiple prestigious awards. In addition to serving on The Mary Kay FoundationSM Research Review Committee, he is Professor and Vice Chairman in the Department of Cell Biology at UT Southwestern Medical Center and holds The Southland Financial Corporation Distinguished Chair in Geriatrics. Dr. Shay is also the Program Director of the Cancer Biology Graduate Program at UT Southwestern and holds the title of Distinguished Teaching Professor. In 2012, Dr. Shay was awarded a University of Texas Regent’s Outstanding Teaching Award, the Minnie Stevens Piper Foundation Professor Award in 2013, and the Distinguished Basic Science Educator Award at UT Southwestern in 2015. 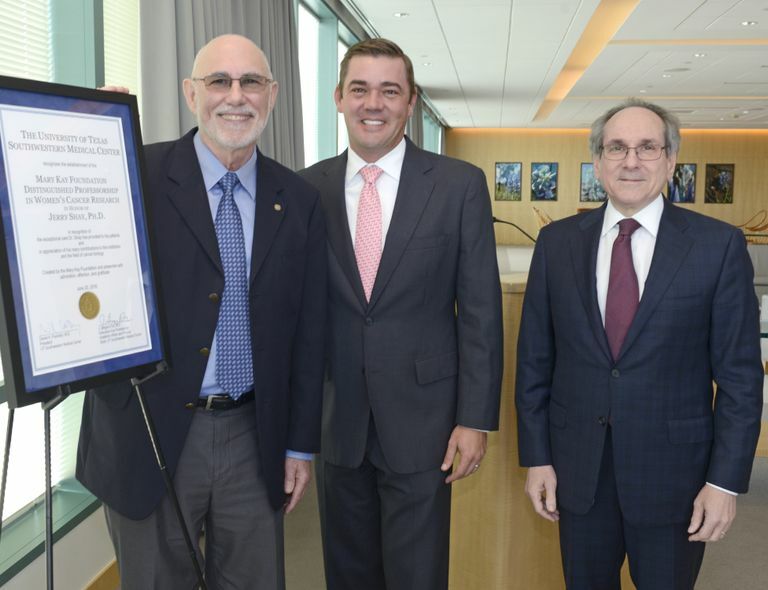 Along with his collaborator, Dr. Woodring Wright, Dr. Shay’s seminal work on the relationships of telomeres and telomerase to aging and cancer is well recognized. Dr. Shay was placed in the Institute for Scientific Investigations as one of the most highly cited scientists in the field of "Molecular Biology and Genetics". Thomson Reuters ScienceWatch included Dr. Shay on its “Doctors of the Decade” list and ranked him as one the most cited authors in the area of General Biomedicine. He was also included in a list of highly influential biomedical researchers in 2013. “UT Southwestern is grateful to The Mary Kay Foundation for its ongoing partnership in furthering innovative research projects that bring us closer to improved treatments for women’s cancers. 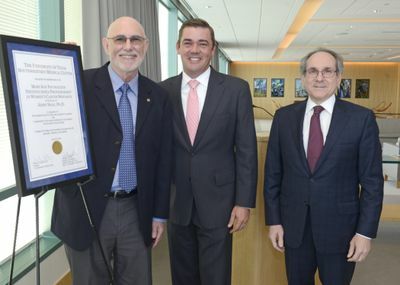 The establishment of the Mary Kay Foundation Distinguished Professorship in Women’s Cancer Research, in Honor of Jerry Shay, Ph.D., is further testimony to Dr. Shay’s decades-long commitment to cancer research at the UT Southwestern Harold C. Simmons Comprehensive Cancer Center and to the commitment of The Mary Kay Foundation to improving the health of women,” said Dr. Daniel K. Podolsky, President of UT Southwestern, and holder of the Philip O’Bryan Montgomery, Jr., M.D. Distinguished Presidential Chair in Academic Administration, and the Doris and Bryan Wildenthal Distinguished Chair in Medical Science. Dr. Shay was presented with this honor during a reception on June 20, 2016 at UT Southwestern. UT Southwestern, one of the premier academic medical centers in the nation, integrates pioneering biomedical research with exceptional clinical care and education. The institution’s faculty includes many distinguished members, including six who have been awarded Nobel Prizes since 1985. The faculty of almost 2,800 is responsible for groundbreaking medical advances and is committed to translating science-driven research quickly to new clinical treatments. UT Southwestern physicians provide medical care in about 80 specialties to more than 100,000 hospitalized patients and oversee approximately 2.2 million outpatient visits a year. To learn more, visit www.utsouthwestern.edu.